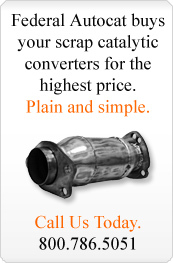 As a refiner of platinum group metal scrap by way of catalytic converter recycling, Federal Autocat Recycling is able to pay great rates for PGM scrap; for the purchase of your collection, especially wire or foil automobile catalytic converters, but also those large units found in industrial sectors that include coffee roaster, rug manufacturers, bakeries and the like. We purchase end-of-life metallic and ceramic monolith and bead catalysts from all emissions control devices. We also accept carbon supported catalyst and other process control catalyst materials. With over 75 years of cumulative experience in the recycling of platinum group metal scrap, we will evaluate your catalyst material rapidly and return cash for your PGM scrap. Contact us to learn more about our great rates for PGM scrap.